Warm weather is around the corner and with it, the need for handcrafted, outdoor furniture that is both attractive and functional. Finding the right Columbus furniture store to find the exact right outdoor furniture does not have to be difficult and it is a bonus when that same store has all the furniture that you need for the entire house. 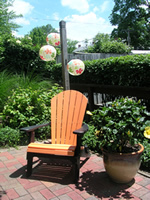 It is all there in Amish Originals Furniture Co., one of best places to find handmade, durable and beautiful furniture. Whether you need furniture for the living room, the dining room, your home office or even your kid’s room, you can find it here. This spacious, Columbus furniture store offers a number of different types of furniture with a number of styles to choose from. It is also one of the leading Amish furniture stores in Ohio, offering you the ability to choose the best furniture for the best prices. There is a reason that you want to shop in one store for furniture for the whole house and it goes beyond just convenience. The more choices that you have to choose from, the happier you will be with your shopping experience. Why Choose Amish Originals Furniture Co. While you can find other types of furniture in another Columbus furniture store, you may not be able to find Amish furniture there. There are few places that sell Amish furniture at all. However, there are even fewer places that sell such a wide and varied selection. Amish furniture is not just “furniture” – it is well crafted from only the choicest materials. An Amish craftsman works on his items so that they are long lasting and durable. Of course, the Amish do not take pride in their work, because they find that to be a sin in their culture, but they do make sure that each item is free from defects and strongly constructed. If you buy an Amish piece, you know that you will get every cent of value from it. But, just because you can find Amish built furniture here does not make Amish Originals the best Columbus furniture store – there are other reasons that this is true. After all, there are other things that you have to consider when choosing a furniture store. First, do they offer shipping or delivery? You can have your item shipped anywhere in the world and our trucks will deliver to local areas for a small fee. Because it is created by Amish artisans, you can be assured that you are shopping at the greenest Columbus furniture store – there is no waste and a minimal amount of packaging for all delivered pieces. All furniture is brought in from local workshops and the scraps are used for other purposes. Instead of buying from a factory where there is no personality to the furniture pieces, you can buy a spectacular and perfect piece of well made furniture that will last for many years to come, allowing you to hand it down to future generations.